“The Unknown Known” has its Madison premiere at 1 p.m. Sunday, Nov. 23 at the Union South Marquee Theatre as part of the UW Mini Indie Film Festival. PG-13, 1:42, two and a half stars out of four. FREE! In 2003, when Errol Morris was touring the country with his documentary “The Fog of War,” he made a stop in Madison to show the film at the University of Wisconsin, his old alma mater. I was lucky enough to get an interview with him while he was here, and we talked about the film, and how former U.S. Secretary of State Robert McNamara’s defense of his role in escalating the Vietnam War was fascinatingly tortured. It was the contortions of a deeply moral man trying to come to terms with performing deeply immoral acts. 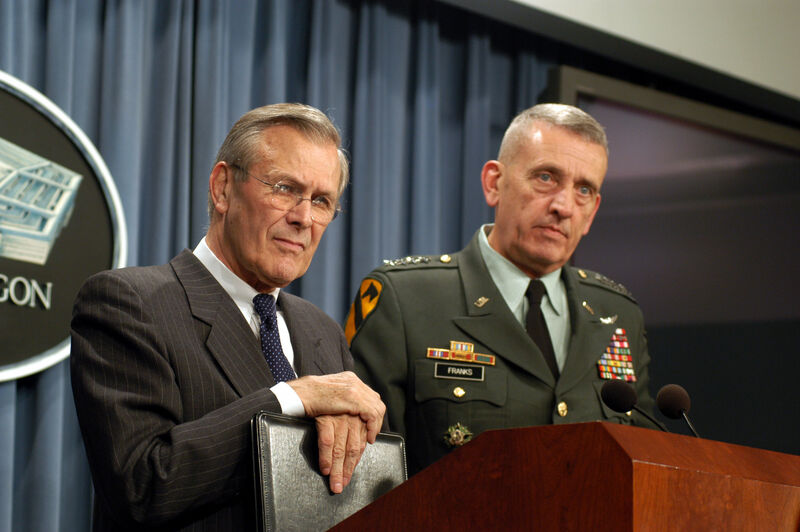 My last question for the interview, with the Iraq War in full swing, was if Morris would consider someday doing “Fog of War II” with then-Secretary of State Donald Rumsfeld. For his narrative hook, Morris uses the flurry of memos — literally millions of them — that Rumsfeld wrote over his long career, largely as a way of clarifying his own thinking. They include the infamous memo that gives Morris’ movie his title. There are things we know we know, and things we know we don’t know, but an “unknown known” is a thing we thought we knew, but didn’t after all. Later, Rumsfeld reverses himself, and says an unknown known is a thing we didn’t think we knew, but did after all. It’s an unknown known whether he even knows what an unknown known is. If that sounds like a rhetorical hall of mirrors, it often plays that way for Morris, whose often frustrated voice off-camera can be heard trying to goad Rumsfeld into candor over the trumped-up weapons of mass destruction, or the “enhanced interrogation” techniques at Guantanamo Bay, or even his early relationship with Nixon, who saw Rumsfeld as an opportunist and not a team player. But Rumsfeld parries easily, a Johnny Carson-like twinkle in his eye, clearly enjoying himself. 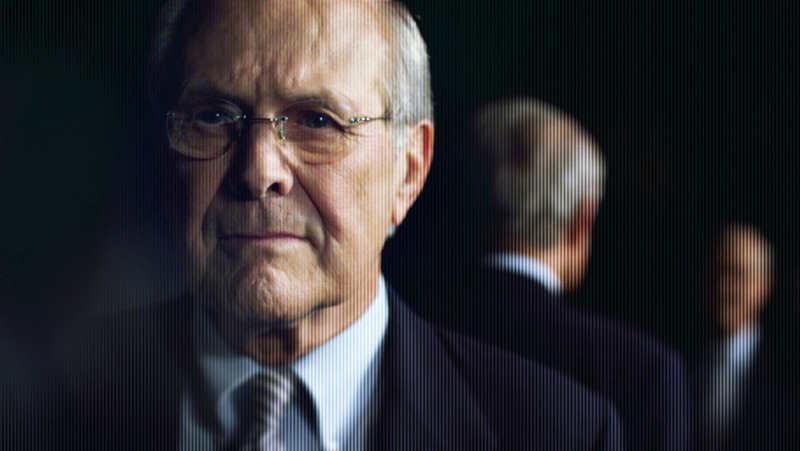 This is a documentary where filmmaker and subject seem to be wrestling for control of the narrative, and Rumsfeld too often seems to have the upper hand. This can be maddening viewing, and just as some critics complained that Morris didn’t “get” McNamara, he certainly doesn’t “get” Rumsfeld either. But “The Unknown Known” isn’t meant to be an interrogation anyway, but a character study. The fact that the character in question resists study is intriguing. Morris includes some of his usual dandy visual flourishes — at one point Rumsfeld’s memos turn into a literal blizzard, at another we can see his torrent of words spiralling into a black hole, with Danny Elfman’s ominous score pulling it deeper. Once I accepted “The Unknown Known” for the relatively modest and quirky exercise it is, I found myself enjoying it, and — dare I say it? — charmed by Rumsfeld. And Errol, if you ever need any more movie ideas, call me. ← “Ernest and Celestine”: Bears and mice, living together — mass hysteria!